This dress is not titled because it was a part of a resort line. It was designed by Stella McCartney as part of her 2017 line and is made from printed viscose. 2) If it’s a design piece: What is it for? What problem does it solve? The dress was designed to be worn. Although it features the theme of things found in nature it is not a costume. The piece is on the lower extreme of the other pieces on display, which could be considered costumes. 3) If it’s an art piece: what is its message? How does the artist get their message across? This design piece appeals to me because I love how Stella McCartney uses pleated fabric. I think that adding the pleating on top of the natural design adds depth making the images seem more realistic. 5) Can you make a connection between this piece and the notion of “fake/authentic”? Create a post in the LP and submit the link here. 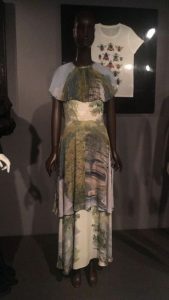 The dress is created using viscose which is a man made material while also displaying an image of something that naturally appears in nature. This contradicting use of material is the fake aspect of this piece. 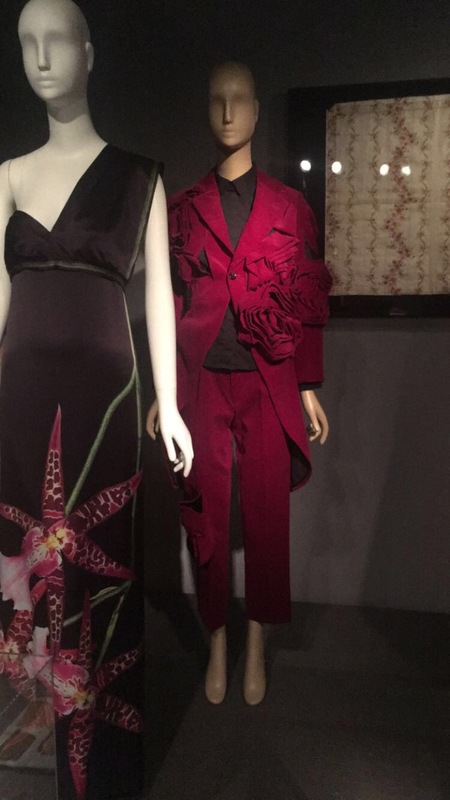 This suit was designed for Comme des Garçon by Rei Kawakubo in 2013. The suit was constructed using velvet. Like the Stella McCartney piece this suits purpose is also to be worn. This piece is also one of the less costume looking pieces within the exhibit. I liked this piece because it displays nature differently than a majority of the pieces in the exhibit. This piece displays nature by adding a three dimensional aspect on top of a seemingly normal design piece. This piece can be related to the notion of being fake because the rosettes are not real nor are they images of real flowers.